In a previous article we discussed how a remote microphone can enhance learning when used with different types of media players. This article will focus on yet another way it can be beneficial for language learning. While some teachers record students with a media player for them to practice their reading proficiency, others use it for those who are just learning how to read or learning a new language. For more fundamental “skill and drill” exercises, the CardMaster™ card reader allows students to echo pre-recorded magnetic card programs to strengthen their vocabulary and phonics skills. Life can also be a little easier to complement these programs by creating your own customized cards for a variety of activities using blank magnetic cards. 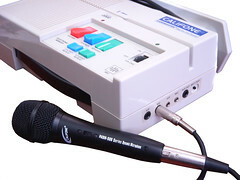 While the card reader’s built-in microphone can operate as the main recording source, using an attached mic can be helpful if the person who is recording is soft-spoken or suffering from a strained voice. The remote mic also enables speakers to comfortably position themselves instead of hunching over the CardMaster, enabling them to maintain the material that’s being recorded as their sole focus.